An American Airlines flight attendant has been suspended pending an investigation after he allegedly smacked a mother with her baby stroller on board a domestic flight, media reports said on Saturday. The incident took place when the woman boarded the flight from San Francisco to Dallas on Friday. 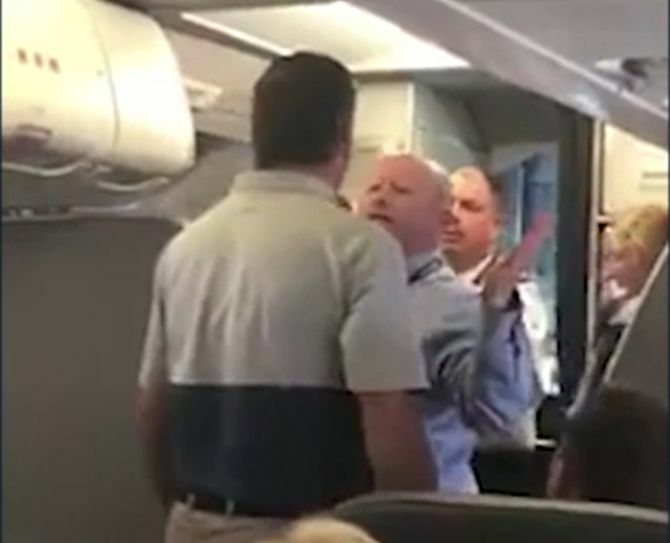 In a video posted on Facebook by Surian Adyanthaya, the employee of the Texas-headquartered American Airlines can be seen arguing with a passenger on board the flight. ‘OMG! AA Flight attendant violently took a stroller from a lady with her baby on my flight, hitting her and just missing the baby,’ Adyanthaya captioned the video. ‘Hey bud, you do that to me and I will knock you flat,’ the man says to the attendant as the distraught woman stands to the side clutching her baby, with tears streaming down her face, the report said. ‘You stay out of this,’ the attendant shouts. ‘Hit me, c'mon, bring it on!. C'mon, you don't know what the story is,’ the employee says. ‘I don't care what the story is, you don't hurt a baby,’ the passenger replied. The woman was eventually escorted off the flight, but the quarrelsome attendant is allowed back on. AA condemned the flight attendant's behaviour and said it had launched an investigation into the incident, the report said. ‘What we see on this video does not reflect our values or how we care for our customers. We are deeply sorry for the pain we have caused this passenger and her family and to any other customers affected by the incident,’ the airline said in a statement. ‘We are disappointed by these actions,’ it said. IMAGE: A screengrab from the video posted on Facebook by Surian Adyanthaya.